Xtra Handset 8155 is a cordless extra handset with large keys. Accessory exclusively for Swissvoice Xtra 2155 and Xtra 3155 DECT telephones. Xtra Handset 8155 offers a high quality hands-free function, an ajustable volume control (with 6 volume levels) and an audio-boost key (+30dB). The ringtones are very loud, up to 90dB so that you never miss a call. A flashing LED on the handset signals incoming calls. 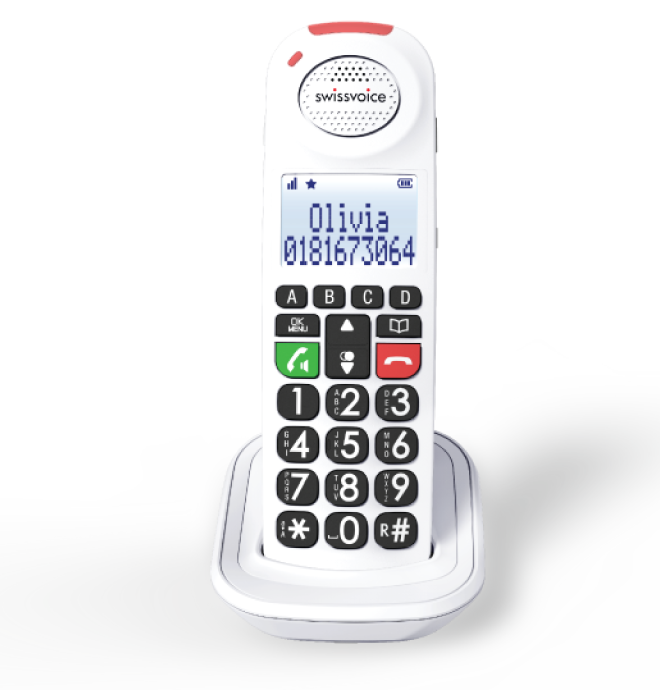 Xtra Handset 8155 is Hearing Aid Compatible and is easy to pair with the main phone. Up to 3 additional handsets can be added to your Xtra 2155 or Xtra 3155 telephone. the same as the ones registered on your Xtra 2155 or Xtra 3155.